The U.S. Postal Service lost $1.9 billion in the second quarter of fiscal 2014, which ended March 31, though the agency showed some signs of positive growth. USPS increased revenue $379 million over the same period last year, and continued to cut personnel and other costs. The Postal Service reduced benefits and compensation costs by $300 million compared to the second quarter of fiscal 2013, largely by relying on fewer career employees. Revenue from first-class mail actually grew slightly compared to last year, despite a continued volume decrease that has played a large role in the Postal Service’s ongoing financial struggles. Overall mail revenue jumped 2.3 percent in the quarter due to the exigent rate increase that went into effect in January. Still, USPS’ liabilities outpaced its assets by $42 billion, and the agency is $2.2 billion in the red since the start of the fiscal year. The requirement to prefund retiree health benefits is primarily responsible for the loss, as the Postal Service has actually netted $1 billion in operating profits in fiscal 2014. Package revenue continued to grow, bringing in $700 million more through the first six months of fiscal 2014 than the first half of fiscal 2013. 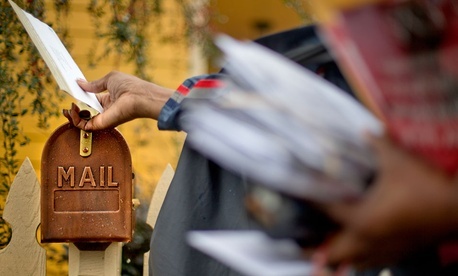 Postal unions have repeatedly stated the recent string of good news paints a different picture than the one agency management has conveyed. The lawmakers themselves, however, interpreted the numbers differently. Sen. Tom Coburn, R-Okla., who co-sponsored the bill with Carper, emphasized the need to act quickly, calling on Congress to pass something “before another quarter goes by.” The reform effort hit another setback this week, however, when House Democrats refused to get behind the latest attempt by Rep. Darrell Issa, R-Calif., to create compromise legislation.